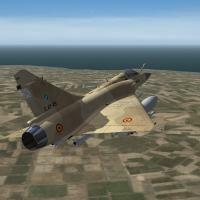 A Mod of the Mirage 2000-5F from The Mirage Factory to make it look like a fictional fighter for the spanish air force. Furthermore, the armies of the affected countries had to change their "non-european" equipment for european equipment. Spain had therefore to sell their US fighterplanes and replace them by european ones. In exchange, the equipment will be cheaper than for standard customers from outside the EU. First of all, big thanks to Crusader for allowing me to release this plane.